It’s that time of the month again: time for us to recommend 5 top cult TV shows, and you to check them out. We’ve decided to do something a bit different this month and focused entirely on comedies from across the pond and a little bit closer to home. So, check them out. If you need any cash to do so, sell one of the DVDs in our Top Traded list! 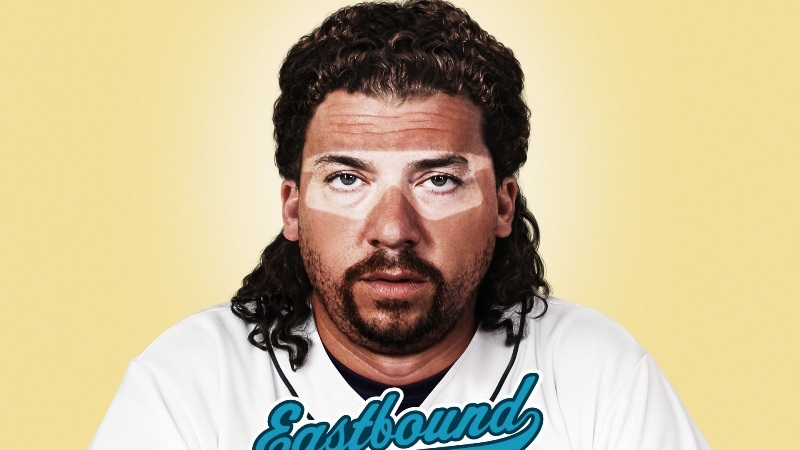 Eastbound and Down tells the tale of a washed-up baseball player called Kenny Powers, who is forced to become a supply PE teacher in his hometown after retiring from the game because of his own ‘jerkiness’. The show is the brainchild of Will Ferrell and Adam McKay, which should tell you everything you need to know about the humour. Powers is arrogant yet weirdly lovable, similar to Ron Burgundy or Step Brother’s Dale Doback, while the jokes wouldn’t be out of place in a Ferrell comedy either. Ren and Stimpy has been around for ages and is often mistaken for a kids’ cartoon (mainly because it was shown on Nickelodeon along with the likes of Kenan and Kel and Sabrina the Teenage Witch). Watching it now, though, through the eyes of an adult, is like re-reading a book you loved as a kid and realising it was 50 Shades of Grey. Ren and Stimpy is one of the weirdest programmes ever made, with surreal and often terrifying humour present throughout (fans of The Mighty Boosh will love it). Although most of us in the UK haven’t heard of them, Tim Heidecker and Eric Wareheim are comedy heavyweights in the States thanks to their cult show Tim & Eric Awesome Show, Great Job! It’s hard to describe the concept of Awesome Show, Great Job! in words: it’s deliberately unfunny, which makes it funny. It’s surreal in the extreme, with sketches that frequently don’t make any sense and amateur actors who seem to be crushed under the weight of their own awkwardness. In a word, it’s weird. Very, very weird. But, if that’s your kind of thing, then you’ll probably love it. You really have to see it to believe it. Oh, and it’s got quite a lot of famous people in it too, including Will Ferrell, Michael Cera, Bill Hader, Paul Rudd and John C. Reilly. Written by professional grouch Charlie Brooker and reclusive satirist Chris Morris, Nathan Barley follows a young man, who’s only purpose in life is to be an overly-trendy berk, and a journalist who works at a trendy magazine but would really rather be dead. It’s a brilliant pastiche of the desire to be cool that strikes all of us at some point. And, thanks to the rise of social media, it somehow seems more relevant today than it did when it was first released. It’s Always Sunny in Philadelphia is a classic American sitcom, with 5 kooky characters regularly meeting in a set location (in this case, a pub they own in Philadelphia) to exchange witty jokes and get into all kinds of silly scrapes. Except, well, that’s about all it shares in common with classic American sitcoms. As explained by Entertainment Weekly, the It’s Always Sunny in Philadelphia gang have, over the course of the show, smoked drugs, composed a rock opera about a troll and killed someone with a chain-saw. Needless to say, it’s gained quite the following despite having a ridiculously low budget. Got any cult TV shows you’d like to suggest? Share them with us in the comments and we might include them in a future post (with credit to you, of course! ).